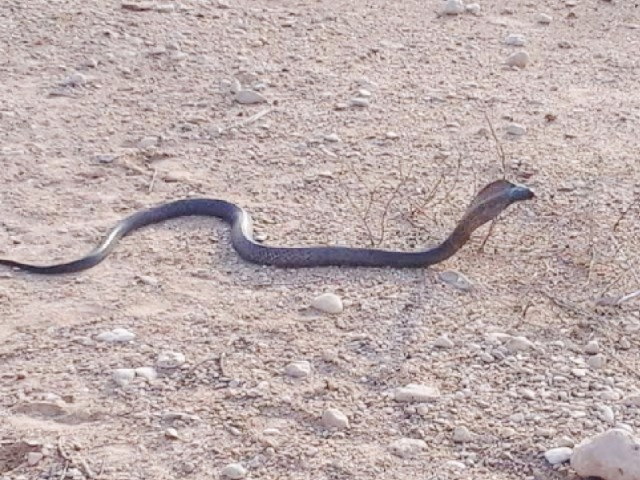 On Oct 9, 2014 late evening, 38 poisonous snakes, including 18 black cobras and 20 vipers, were recovered from a passenger wagon near Jamshoro. This is the first time that the Sindh Wildlife Department has recovered such a large consignment during a search operation. The raid party was informed that a man would be transporting snakes in a private car. They had not expected to find the snakes being taken to Karachi on a public transport vehicle. “My target was a car, not a passenger wagon,” Wajid Shaikh, the field officer and in-charge of the Hyderabad division raid party said. “Who could have imagined that such poisonous snakes would be carried on a passenger vehicle?” Shaikh explained that the passengers shouted and jumped out of the wagon in fear as the culprit, Allah Dino Jogee, stopped him from untying the poisonous bundle. Jogee, who has been involved in this business for the past five years, was on his way to Karachi from Matli in Badin district. Hailing from a village near Sajawal district, he collected snakes from the areas of Umerkot, Badin and Tharparkar where their natural habitat is found. From there, he supplies them to buyers in Karachi. During his initial interrogation, Jogee said that he also supplied snakes to some institutions in Karachi. “I have two major buyers in Saddar,” he told the wildlife officials. In this highly risky business, Jogee charges Rs5,000 for each snake. According to him, they are sent to countries, such as China and Korea. He added that they were used both as food and for medicinal purposes, with some institutes also purchasing them for ‘research’. Jogee was locked up at the Hussainabad police station in Hyderabad overnight, and was released on Friday. In accordance with Section 33-A of the Wildlife Law, he paid a fine of Rs20,000 and will produce himself before officials whenever summoned. While the illegal trade of snakes is not a new story for the Wildlife Department, officials had never before arrested a man carrying over three dozen snakes. The snakes have been released in an unidentified location, with provincial conservator Javed Mahar saying that they were released in the jungle, which is their natural habitat. The illicit business has flourished for years, with Karachi as its main centre. Residents of other areas, such as Tharparkar, often provide animals to these traders, who offer them handsome amounts. Due to joblessness, increasing poverty and the good prices offered by these traders, several rare species are under threat across Sindh. Hey, em crazy about snakes and looking for a snake breeding centre in Pak, coz I want to work for snakes can u plz tell me where I can find snake breeding and care centre.